The long weekend was a success! If you are anything like me you did a lot of relaxing and a bunch of eating! We started off the weekend with this pizza. I get so bored of the usual red sauce and mozzarella with toppings pizzas. To deal with my boredom, I bring you….variety. 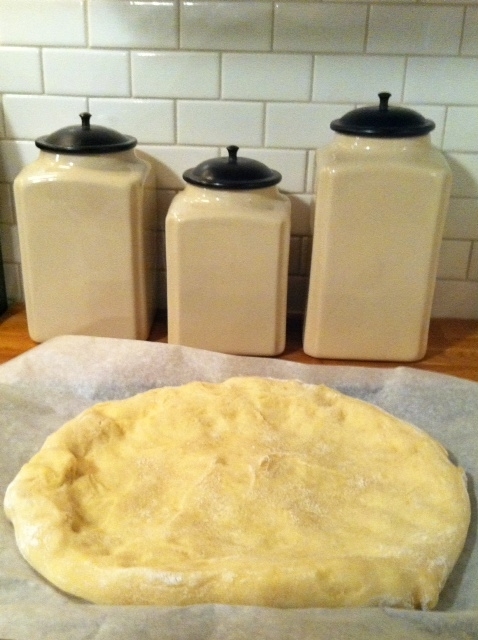 I use Publix pizza dough because as much as we try, we can’t find a home made one that we like better. However, if you don’t have a Publix or a dough recipe you love, I recommend this one. 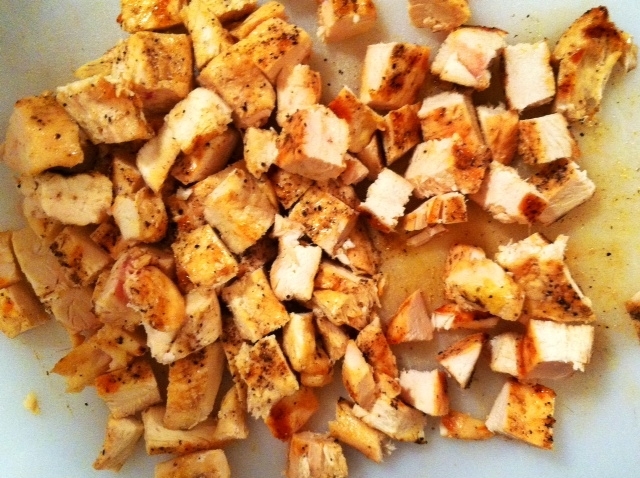 Start off by marinating one pound of boneless, skinless, chicken breast cutlets in olive oil, salt, pepper and garlic. Grill and cube. I find that using cutlets makes the chicken so much more flavorful and keeps the chicken from drying out. Then toss in your favorite BBQ sauce. 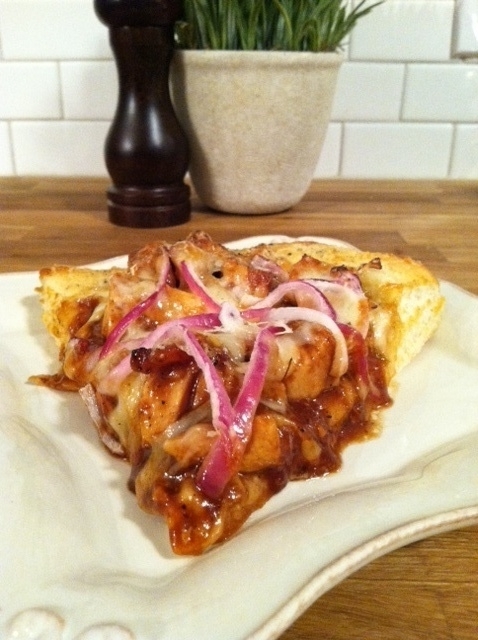 A parchment paper lined cookie sheet helps your pizza to bake evenly and keep from burning. A Silpat would work too. 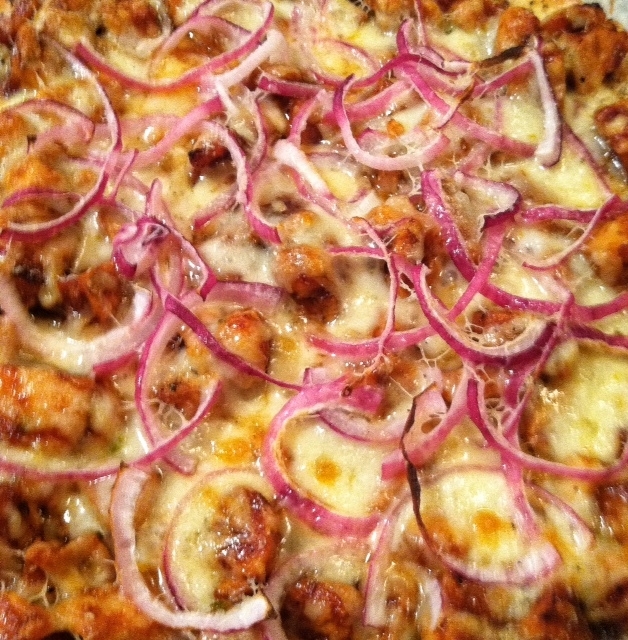 There a really only 3 toppings: The chicken, pepper jack cheese and thinly sliced red onion. For the cheese, forget the pre-shredded bags . The powder on that stuff keeps the cheese from melting to its full capacity. 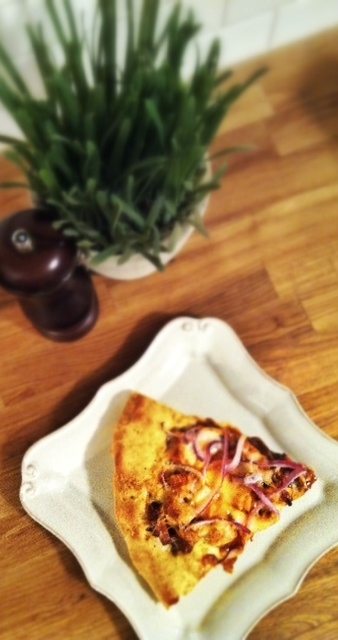 Decorate your pizza and send it back to the oven to get warm and cheesy. It is o.k. if you have a large crust. We are going to dress that up with butter, Parmesan and black pepper. 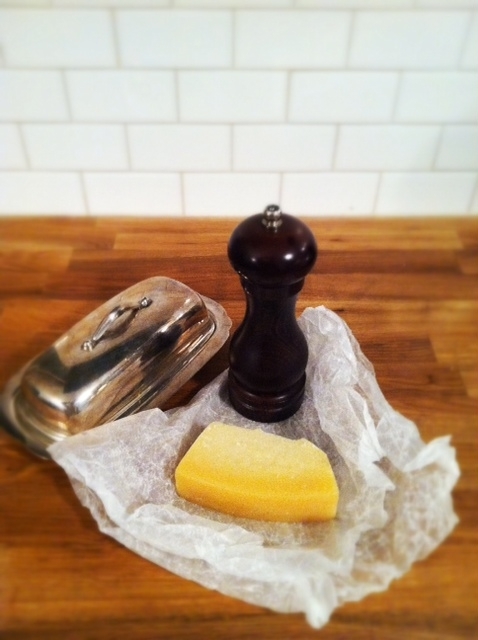 Did you know if you wrap your Parmesan cheese in wax paper it will help preserve its shelf life? Then, sink your teeth into this guy. Or use a fork. Whichever you prefer. Marinate chicken in olive oil, salt , pepper and garlic. Return chicken to the fridge to marinate. Cut chicken into small cubes. 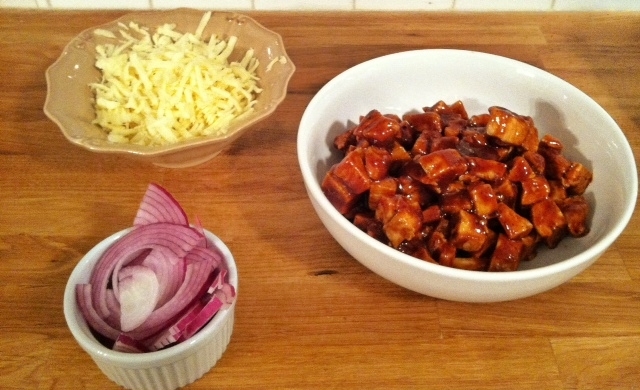 In a bowl, toss the chicken with the BBQ sauce. Then spread the chicken onto the partially baked dough. 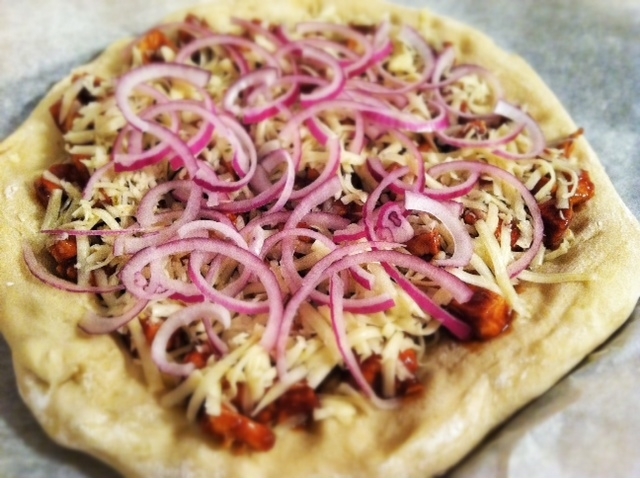 Next, top with cheese and onion. Wow, Sara! That sounds so yummy! I’ve always liked CPK’s bbq chicken pizza (they also use a little smoked gouda on theirs) but I really love your addition of butter & pepper to the crust edges — that might be my favorite part 😉 I’ve bookmarked you — can’t wait to keep reading! Oooh! Smoked Gouda would be fantastic!